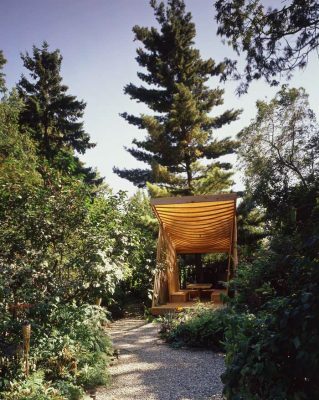 Set in a private garden, the pavilion design was inspired by Eastern philosophy of harmony with nature. It is used for sitting and dining, as well as workshops, concerts, and other activities of a local Artist Cooperative. The layering of its lattice-like elements create a complex relationship between inside and outside, producing subtle and shifting glimpses of the garden beyond. The interwoven elements of the trellis produce a constant interplay of light and shadow, visually connecting the sky to the earth. To amplify a connection to the sky, a mirror is embedded into the surface of the dining table. The pavilion is oriented due north-south, and the angle of the roof is in perpendicular alignment to the sun at the summer solstice. This configuration provides for the maximum degree of shading in the heat of mid-summer and also acts as a large-scale sundial. Similar to the traditional Japanese tea house, the pavilion is designed for both social engagement and private contemplation.